If you want a great example of remarkable, persistent painting, see Stephen Hayes’s exhibition at Elizabeth Leach Gallery, which continues through May 28. Hayes is showing a group of medium-sized (about two-by-three feet), very loosely painted landscapes. For the basic images he worked from Google maps street views. From the text on the wall we know that these images are all from sites of recent violent tragedies such as Littleton, Ferguson and Paris, but you wouldn’t know that from the paintings alone, because there’s nothing in them that speaks to that issue. Maybe that’s the point for the artist in beginning the works, a way of sorting out what’s going on in the world. In the end the art process takes over and the social meaning is left in the consciousness of the artist. Now that they are paintings exactly what they depict isn’t all that important. The scenes themselves are not picturesque, just mundane, like amateur snapshots. What Hayes has done is to take the mundane scene (perhaps as any scene of violence is before or after the incident itself) as a structure for what now speaks of painterly painting. In his film Painters Painting, 1973, (https://youtu.be/Vhj0ajdWjiI) Emile de Antonio asks Willem de Kooning, “What does painterly mean?” De Kooning replies, “That you can see it’s done with a brush.” Hayes brushes, and he also scrapes and wipes his paint forthrightly—and you can see it. 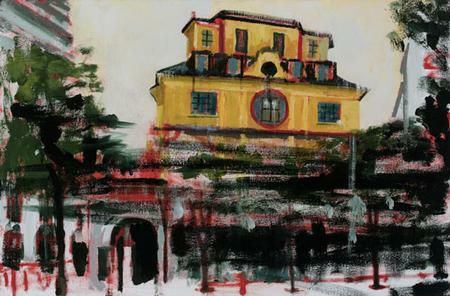 The viewer’s enjoyment (conscious or not) of these paintings is due to the jabs, gestures, swipes and touches of the artist’s hand as he applies paint. 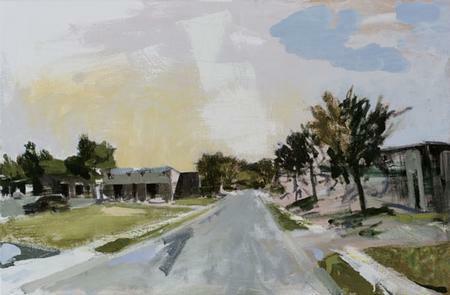 In Ferguson (8.19.14), 2016, Hayes shows us a classic urban scene, our viewpoint in the middle of an empty street with the perspective lines of sidewalk receding directly into the center distance. On the right are three small trees, their foliage a jumble of quickly brushed greens—and that brushy-ness animates them, giving personality. Directly above the trees is a puffy light blue “cloud.” Its rounded form contrasts to the jagged gestures of the trees below, but it is not fussed over, just daubed onto the canvas, staying fresh. To the far left is a car in a parking lot. We see it is a car through the tiny swipes of just a very few small brush marks. We sense it is a parking lot because a “car” is there. Trees, cloud, car, but the key to the picture is a brushy inverted v-shape in the road in the foreground. It is an overt “brushmark,” almost living on its own, but sticking to the description of the street just enough—a Post-it Note level of stickiness. That must be part of the excitement in these paintings: they just barely hold together. The trees, the cloud, the car, the gesture are all painted differently. It is not the method of paint application that stitches the whole into a fabric. It isn’t a fabric. It’s a house of cards. All of these paintings are “impressions.” Nothing is clear. They are like glimpses through a car window. 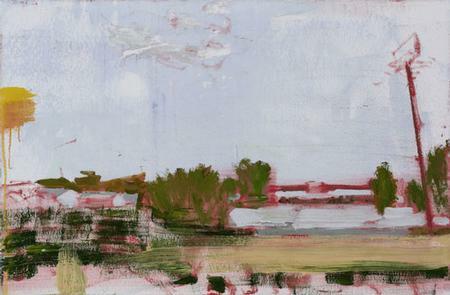 In Kalamazoo (2.20.16), 2016, there’s a big bluish sky with a few cloudy gestures, and along the bottom third of the canvas a few long horizontal paint gestures blur a landscape—feeling like you’ve just looked up to notice the scene as you whizzed by. There are a few vertical brushy green bushy shapes, suggestions. Again, just a couple of well-chosen notes make the painting gel. On the far right is a tall, highway-sized sign post (just an empty red rectangle atop a thin red line) serving to compositionally hold your eye as it wants to zip along the horizontal out of the picture, and also suggesting, “hey, this is a road trip scene,” which snaps us into a little piece of memory. At the left edge, a drippy daub of yellow in the “sky” serves a compositional, but no representational, purpose. What, for me, are the best paintings in the show have a balance between the abstract gesture and the representational mark. In another interview in the Artforum issue, Budd Hopkins says, “What I mean when I talk about ‘skill’ is what is meant when you talk about skillful painting, that the actual physical handling of the paint has interest in itself.” That’s much of the pleasure of looking at Hayes’s work. In some paintings there is a strong architectural image such as Paris, Bataclan (11.15.15), a theater, or Charleston (6.17.15), a church. 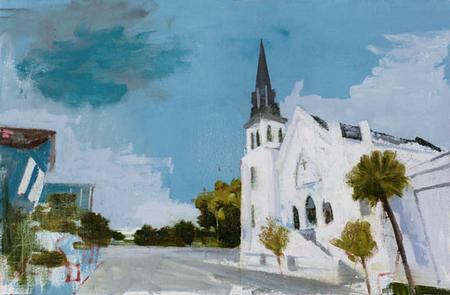 These images (all of the paintings are based on the sites of recent public tragedies, but you wouldn’t know that from the paintings alone) draw the viewer’s attention so strongly that the skillful painterly aspects are overwhelmed. Color is also important in these paintings. 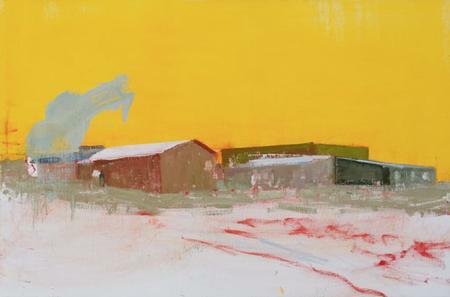 La Loche, Saskatchewan (1.22.16), 2016, depicts a few bland agricultural buildings along a central horizon line. Must be winter because the foreground is mainly white like snow. However, defining that snowy field are a few red brushmarks. Why red? Well, of course to set off the broad expanse of bright yellow sky! As in many of my favorite artworks I have the feeling of “how does he get away with that?” I think that here it is because one of the things this painting is about is making that big area of bright yellow make sense. While the yellow is attention-grabbing, there is a lot of color action among the greens, tans, and reddish-browns in the narrow line of buildings. A strange gray brushy shape leaps into the sky at the left as well, one of those odd things that Hayes seems to enjoy throwing in, just to balance out a composition. Again: “How does he get away with that?” I don’t know, maybe it just has that feeling of seeing something indistinct from a drizzly window.